This entry was posted in cherry blossoms, gardening, greenhouse, greenhouses, organic, organic, organic farming, Seasoil, urban farming, West Coast Seeds and tagged buttercrunch lettuce, cherry blossoms, Dutch treat seed starter, East Vancouver, lettuce, seed, seed starter, seeds, starting seeds, starting seeds in greenhouse, Vancouver, West Coast Seeds. Bookmark the permalink. Know what you mean by those teenie tiny seeds. Hope my post will help a little, here is rhe link. Love the cherry blossom photo, gorgeous. Thanks Norma-what a great idea! You’re off to a good start this season-enjoy that New York spring! I am so impressed by how on it you are! But I have an unrelated question is that’s OK? About using containers other than untreated wood to grow organic produce? Do you worry about plastic leaching or metal rusting and contaminating your produce? Or is this a non-issue? Hey Jess-finally got a chance to look at that article. 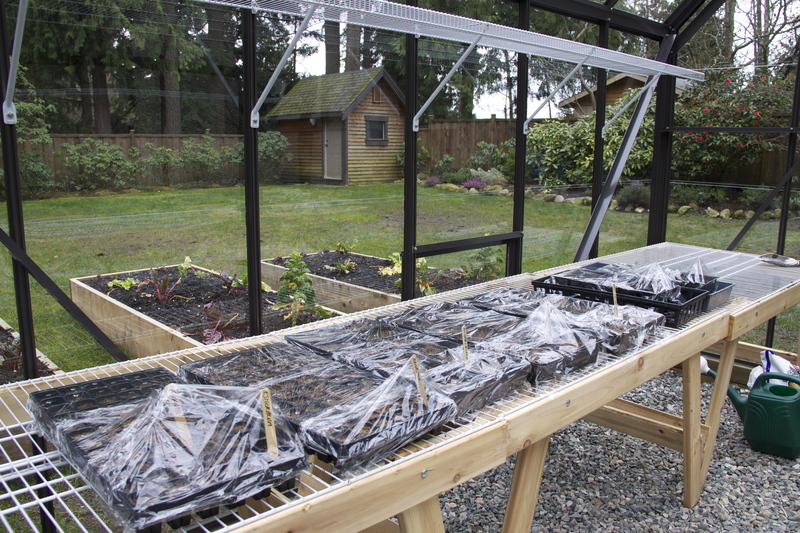 I love the idea of turning “unusable” space into an opportunity to grow fresh produce! There’s not a lot of space for the roots in rain gutters or any natural drainage, but if people line the gutters with gravel so the roots don’t rot sitting in the damp soil, poke some holes in the bottom for drainage and fertilize regularly it could turn out really well. Love it! The greenhouse looks fantastic. I could see making a nice cup of tea or coffee, early in the morning, and looking forward to spending a leisurely moment with the seedlings to watch them grow day by day. This is the true meaning of “comfort food,” isn’t it? Thanks Granny- that sounds like the perfect morning to me! Please excuse the brevity and informality of this message; it was sent wirelessly from my iPhone. No need to apologize. Hearing back is nice however short it happens to be. It is the thought that counts.